Brides on their wedding day must go the extra mile to make sure that every detail is set to perfection – from the food to floral arrangements to music and most importantly, the dress! In addition to all of these things, brides also must concern themselves with their make-up routine so that they look flawless in-person & for the photos on their wedding day. These days, women have various options to how they want to apply their make-up for the big day. 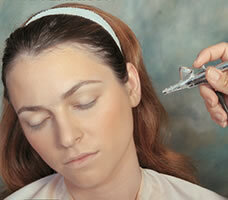 A trend that is become more commonplace is the airbrush makeup application. It’s a concept that originated from the film business to ensure that the actors faces looked flawless on-screen through all the bright lights and could withstand the long hours of the work day. There are several processes (alcohol based, water based, silicone based) that help to give different types of complexion depending on the client’s desire. The benefits of this technique are plentiful – the process is a simple “spray” application that can last through a long day of wedding photos and activities without runs and splotches. It goes light on the face and body so it does not feel clumpy or cake-y and can quickly cover-up any beauty marks, tattoos or last minute rash or breakout (probably from all the exciting nerves!) It also does a great job of keeping a natural look so the bride still feels like herself which will show nicely in the photos! Always use friends as a resource for recommendations of makeup artists with thorough experience with this technique – word of mouth is the most guaranteed form of advertising. Make sure to call ahead to schedule a trial appointment for you and/or bridesmaids so you can figure out if there’s any allergies, rashes or unexpected results. Discuss with the makeup artist any allergies/sensitivities to skin care so this can be factored in when making up the airbrush makeup. This should be a lightweight process. If you find that the results are thick and uncomfortable, then it was probably not done at the best quality. Pricing is comparable to any other makeup artist or can be more expensive for this type of occasion. Make sure this gets budgeted accordingly so you don’t have to worry about unforeseen costs. We hope these are helpful! Check back with us for more questions/concerns and some of our other posts on wedding day makeup & skincare tips!